Thank goodness for my good friend Denis Desjarlais, who lives up near the Canadian border in Jay, Vermont. A gorgeous waterfall along the Missisquoi River near North Troy, Vermont, pictured last Sunday. Jeff and I were leaf peeping Sunday and found ourselves driving near Denis’ house, so we gave him a call to see if he wanted to meet up with us. He did, and we had lunch and then drove around, looking at the scenery. The foliage was so-so, but Denis had a trick up his sleeve. He knows all the beautiful, remote places up that way that nobody else knows about. so he took us to them. Denis led us down a zigzag maze of remote roads, full of potholes, mud, and through a battered covered bridge that had been smashed by a moron driving an oversized truck a few months earlier. I had no idea where we were, but eventually, Denis had us drive into a pulloff covered with pine needles. “You’ll like this,” he said. As we walked along a sun-dappled path, I heard a roar growing louder and louder. 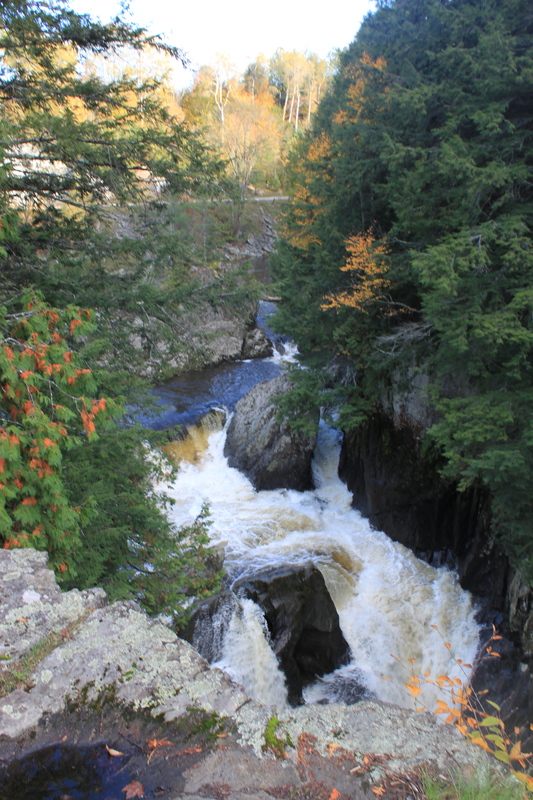 We stopped at an overlook and saw a beautiful waterfall crashing through some rocks. Denis is the perfect tour guide in that he doesn’t talk much. He just lets the scenery and the attractions speak for themselves. 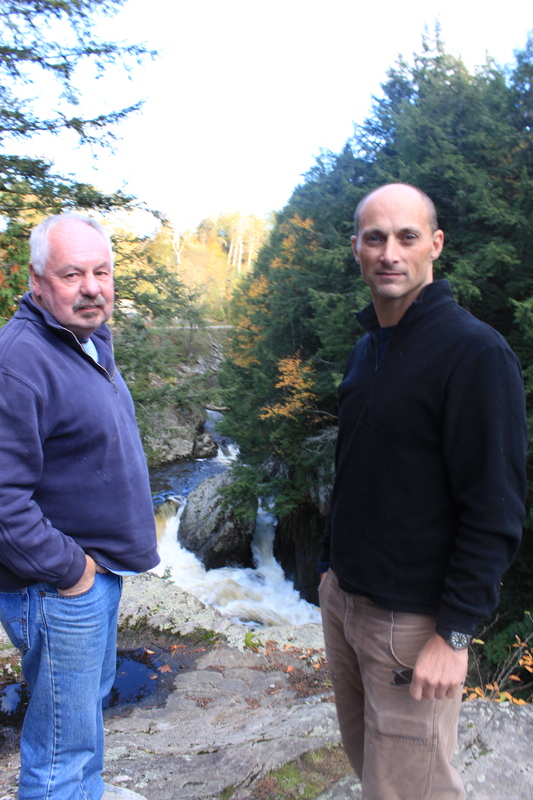 Denis, right, with Jeff, leads a tour of a beautiful waterfall and natural area Sunday near North Troy, Vermont. It’s got to be one of the prettiest waterfalls in Vermont, on the Missisquoi River near North Troy. I’ve been all over Vermont and thought I knew all the attractions, but I was wrong. The water was running high because of a severe rainstorm a couple days earlier. That made the falls even more spectacular. 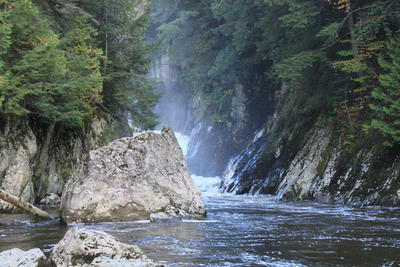 The roar practically shook the rock ledge we were on, and mist from the falls sent cool, fresh air over the landscape. I was trying to snap so many photos in this natural area that I lost track of Denis and Jeff as they walked down a path. I had to kick myself because they went to a place with an excellent view of the falls. I didn’t know where they were so I went back up to the truck. When they emerged, they said they’d wondered where I went. I grumbled that I was stupid to lose track of them earlier. Jeff and Denis insisted they bring me back down where they’d been. So I ended up making them retrace their steps down the path, through a steep jumble of loose rocks. But Denis and Jeff insisted they didn’t mind, once again demonstrating their patience with me. Mist rises from a falls along the Missisquoi River near North Troy. Denis led us on a tour of the beautiful natural area near the falls. I certainly appreciate the trip down that path, as the view of the falls, mist rising from it, the rocks and the hemlock trees gave he surroundings an almost primordial feel. Denis next took us to another, smaller waterfall, where the water had carved some grooves in the stone that look like they were made by an Italian sculptor, not nature. So if you need a nature tour up near the Canadian border of Vermont, contact Denis. He’ll show you around. This entry was posted on October 6, 2010 at 3:28 pm and is filed under Uncategorized. You can follow any responses to this entry through the RSS 2.0 feed. You can leave a response, or trackback from your own site. matt, it was a pleasure playing tour guide for you and jeff. i had a great time. btw, thanks for the lunch!